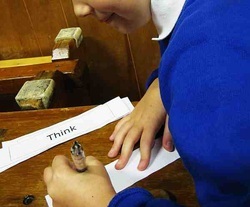 The Growing Ideas Project was a collaboration between Caroline Small, Terry Chipp (visual artist), Lorraine Butler (film-maker, multi-media artist), children in years 3, 4, 5 and 6 and their teachers. In 2011 I will be working as lead artist on this exciting and ambitious project in Dronfield, Derbyshire. • make learning more interesting and exciting, • inspire children and staff to be curious, • improve progress in literacy…. ? In Y5 and Y6 our topic was Chocolate... not just about food but a chance to learn about exploration, discovery and Aztec culture among other things. ... and throughout the project we experimented with new ways of extending our learning in all curriculum areas into our outside space. I have over 25 years of experience in formal and non-formal education settings. 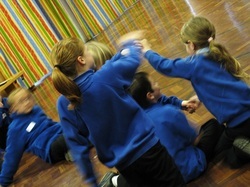 I lead projects and workshops in drama, theatre-making, play writing, creative writing and storytelling for people of all ages and abilities. I have also worked as a Creative Agent for Cape UK/Creative Partnerships South Yorkshire since 2006.